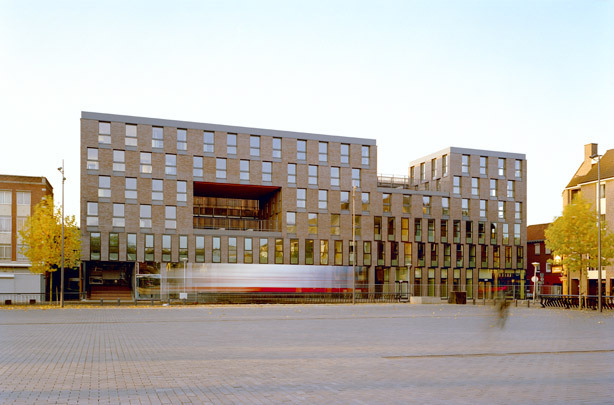 This urban block of 30 apartments on a basement of commercial premises and a police station replaces a post-war apartment block on a square (Nolensplein) in het centre of Venlo. There are two parallel slabs of units, one facing the square, the other southwards and sunwards. Separating them is a shared external space designed as monumental timber steps doubling as tiers of seating. The police station is largely tucked under this stepped slope which takes up the entire length and height of the complex. Large gaps in the elevation overlooking the square keep the sight lines open between the stepped space and Nolensplein.